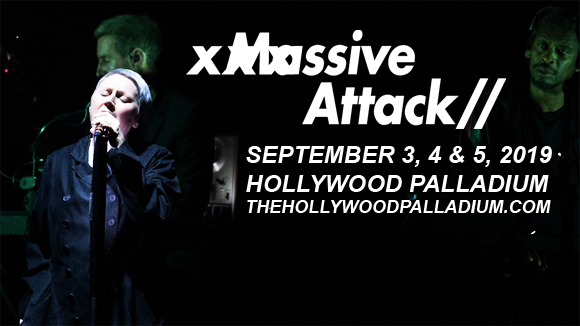 Trip hop visionaries Massive Attack will be performing at Hollywood Palladium on Wednesday 4th September 2019 for the second night in a row on their Mezzanine XXI Tour, which re-imagines their crucial 1998 Mezzanine in celebration of 21 years since its release! With mind-blowing audio and visual effects, fans will experience an immersive and utterly unique show, both full of nostalgia and with a nod to the future! Consisting of Robert "3D" Del Naja, Grant "Daddy G" Marshall and formerly Andy "Mushroom" Vowles ("Mush"), Massive Attack is a British trip hop group formed in Bristol, England in 1988. Known for its distinctive sound, which mixed elements of hip hop, psychedelia and electronica, the group released its debut album, Blue Lines, in 1991, launching the single "Unfinished Sympathy", which went on to be voted the 10th greatest song of all time in a poll by British newspaper The Guardian. Both Blue Lines and their following album, Mezzanine (1998), feature in Rolling Stone's list of the 500 Greatest Albums of All Time. Mezzanine charted at number one in the UK, as did their third studio album, 100th Window (2003). To date, the group has released five studio albums, selling over 11 million copies worldwide.